Solar panels produce DC electricity which is the same kind of electricity that batteries output. For the power from solar panels to be useful in the home it needs to be converted from DC into AC Alternating Current, this conversion is made possible by a device called a power inverter. In most grid connect solar power systems solar panels are connected together in series also called a string. The effect of connecting solar panels in a string is the creation of higher DC voltage, this helps reduce power loss however there are some problems associated with the string setup, to get around these problems micro inverters were invented. A micro inverter does the same thing as a larger string inverter converting DC into AC. 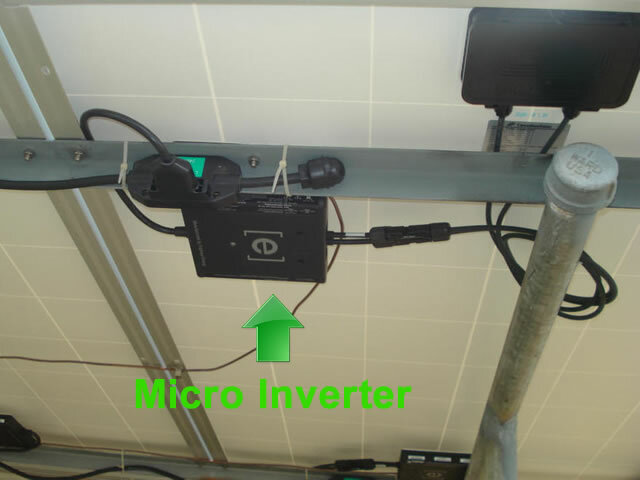 The difference is that a micro inverter is much smaller and is mounted directly onto or very close to each solar panel, so one micro inverter for each solar panel in the array. Micro inverter technology is not new and has been around since the late 90's however only in recent times advances in performance, price reductions and a greater range of products available, micro inverters have become more popular. Globally there are at least 20 different brands of micro inverter with at least eight approved for sale on the Australian solar market. The term AC solar panel is a little misleading as solar modules themselves only produce DC. An AC solar panel is a solar panel with a micro inverter fitted to it. In the future it is possible that solar panels will have fully integrated inverters that are a part of each solar module, however, at the moment this is in the science fiction category. Most solar power systems installed in Australia are configured in a string sending large volumes of DC electricity through one cable to the main string inverter, if the insulation of the main power cable fails it will be like having a 600V DC welder boring a hole through your tin roof. Sending a high DC current through a cable can create a lot of heat, the nature of DC electricity can cause electrical cables to loose their conductivity creating resistance and even more heat increasing the risk of fire and arcing. Because each micro inverter converts the DC to AC at the panel before it travels through a cable this risk is reduced. The fuses and protective systems for high voltage DC power are more expensive than those used in AC systems. Below is a good video by SolarQuotes.com.au about how the shade can effect the output of solar panels. If one solar panel in a string array becomes dirty or shaded, the output of the entire array will be reduced. For example, if you have three solar panels in an array connected to a central string inverter and an unwelcome visitor leaves a deposit on just one of the panels reducing its output by 50% then the other two panels will also have their energy production decreased by 50%. In a micro inverter solar panel array, the same deposit restricting one of the panels will not have any effect on the performance of the other two units. Not all solar panels are precisely identical, due to the way they are manufactured there are always slight variations between each panels output, this is refereed to as "mismatch". Micro inverters can adapt to the solar panel they are connected to disabling any mismatch effect. Different maximum power points can exist for each solar panel. The maximum power point is the optimal position for extracting power from a solar panel, micro inverters can target the maximum power point better. Most power inverters have a type of fault finding or power monitoring system. String inverters can only monitor output from the entire array. Because micro inverters are attached to each solar panel a more precise drill down of system performance is possible. Having a Micro Inverter pre-installed to produce an AC solar panel at the factory can save time and costs for both the end consumer and in the manufacturing process. If a central inverter fails, the entire solar system will break down and stop producing power, if one Micro Inverter fails it will only effect the output of the solar panel it is connected to with the reaming panels continuing to operate. 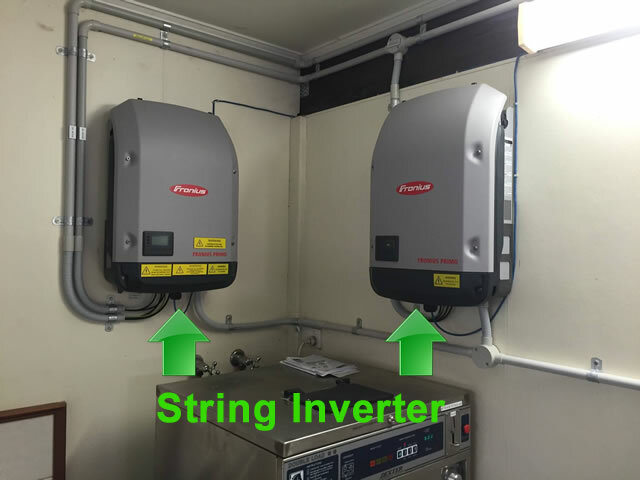 A string inverter has a limit to the number of solar panels in can be connected to, with micro inverters more solar panels can easily be added to the system as each AC solar panels has a single dedicated inverter. Solar panels in a string system need to be mounted in the same direction so they all start producing power at the same time to trigger the inverter. AC solar panels operate independently of each other so can be facing in any direction. Micro inverters are placed on, or close to each solar panel wherever that panel is installed, this means they are more exposed to the elements and will need to be well sealed against moisture, in time even the best rubber or silicon seals can fail and allow water into vital electrical components causing a short circuit. If a fault does occur the solar electrician will need to access the unit up on the roof. The technology of micro inverters is advancing but at this point in time they are not as efficient at producing power as series string inverters. Micro inverters are more expensive to buy than even high-quality series string inverters. However, the price is coming down slowly. Why would I choose AC solar panels and micro inverters? The most common reason AC solar panels and microinverters would be a better choice over a string or central inverter would be the ability to have your solar panels mounted in different orientations. Even if they cost more to install at the start the system payback time could be shortened with greater output if shaded panels are in the power equation. Another good reason is the ease at which a micro inverter system can be expanded by adding different sizes and brands of solar panels.